OMG I can't wait to use this in pet battles, I bet it will be immune to ground type attacks, ITS GONNA PWN SO BAD! If you want to see what this looks like, The baloon is tied to the mailbox outside Stormwind Bank and various other places to promote the Faire event. Looks virtually the same as Flimsy Darkmoon Balloon which costs 9s 50c from the balloon vendor wandering around. The difference being that the flimsy version is an item that, although seems to have unlimited use, is an item and not a companion, therefore taking up a bag slot and also doesn't count towards your companion count. Thank god I bought the Flimsy one first, I would be so mad to get the ballon for 90 tickets since you can have something similar for so little cost! Very dissapointed that it doesn't work with my Fetch Ball. Balloons make bad pets. I just noticed, this is not showing up on my armory. I have 199 pets in game, 198 per the armory. Weird bug. Too expensive imo .. for a not even cool companion ..
anyone else noticed this pet shows up in your spellbook as well? I was wondering the same, since the other balloon pets are in my pet tab. I'm also annoyed that this (and any other balloon) cannot battle, yet a lantern can? It should have a high-level finishing move called Pop where it sacrifices itself for your team by blowing up the opposition. You'd have to rez it afterward but hey, you won right? Does anyone else find it incredibly strange that it shows up not only in your pet list but also in the general tab of your spellbook? Today's market news: Darkmoon Balloon is up, Arakkoa Feather is down, and Light Parchment remains stationery. Blizz gives you the option to name your pets. No, nothing like 'Ballooney' or 'Sir Floatsalot' for my balloon. I like to use phrases like 'Who Farted', 'I Have To Pee', or 'Helium Is Dumb'. Whatever fits my current mood. I change the phrases quite often. Give it a try. It's fun/funny... :) Makes me giggle. 1) "Static friction" - similar to Arcane Blast; rubs the target for weak dmg at first, but builds over time. 4) "Whip" - similar to Lash; the balloon's string whips the target 1-2 times; an extra time if faster. Moves 1,2,5,6 are magic based, moves 3,4 are flying based. 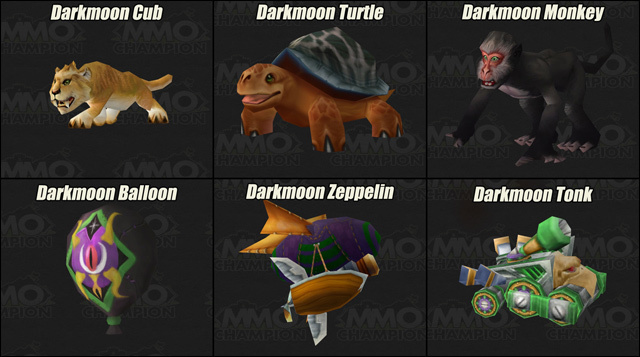 Darkmoon Balloon comes as a B/B breed.